Commissioned by Lincoln's friend, J.B. 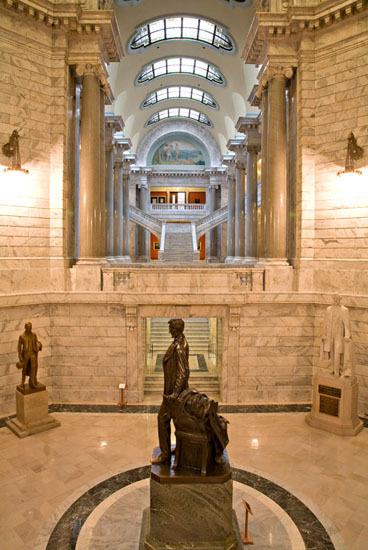 Speed and created by Adolph A. Weinman, this 14-foot high bronze statue in the capitol rotunda in Frankfort was unveiled in 1911 by President William Howard Taft. Weinman also created the Lincoln statue that sits in the public square of Lincoln's hometown, Hodgenville, Ky. Also represented by statues in the rotunda are Henry Clay (left), whom Lincoln idolized and Jefferson Davis (right), President of the Confederacy.